… and how a simple scarf inspired me to become a full-fledged knitter. Several Christmases ago, my husband Branden gave me a gift that transformed those aimless moments of spare time spent on the couch drinking coffee and watching TCM, into crafty adventures that would soon become quite the hobby. 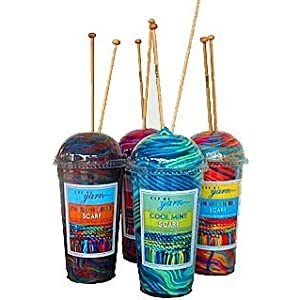 The gift came in a large plastic Slurpee-like cup and included a beautiful skein of raspberry yarn with a pair of size 10 bamboo needles sticking out of the hole at the top. The label on the container read “Passionfruit Scarf.” It came with directions to knit a no-fuss garter stitch scarf. Simple and sweet. 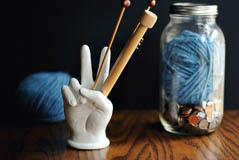 As I opened the clever little “cup o’ yarn,” Branden cracked a smile and said, “I remember you mentioning a while ago that you wished you knew how to knit.” I did mention that…quite a while ago and in passing. He remembers these things and I love that about him. Within three days I collectednotions, needles, and yarn to start my own little knitting nook. I was so involved in this hobby that I barely knew anything about save for how to knit a knit and purl a purl. It was a bit like being all dressed up with nowhere to go. Sure, I was getting comfortable with the basic stitches thanks to the tiny instructions on the foldout pamphlet that came in the yarn Slurpee, but that wrinkled little square of paper would only get me so far. That’s when Knitting for Dummies became my big time read. I highlighted, underlined, and dog-eared–knitting swatches as I read. Frankly, I’m surprised I didn’t make flashcards. I started this blog (under the name ‘The Greenhorn Knitter’) back in 2009 because I wanted to share my new skills, frustrations, tips, and stories from my knitting adventures and misadventures with others who share the same passion, and to also log the milestones in my journey. Now, this is a log of my continued fiber journey and how I am maturing and finding my place; possessing what Elizabeth Zimmerman considers the tools of any good knitter; wool, needles, hands.